In the history of warfare, an elite group of men have attained almost legendary status through their courage, ambition and unrivalled military genius. But many of these same men possessed deep personal character flaws. In Heroes & Villains, acclaimed historian Frank McLynn focuses on six of the most powerful and magnetic leaders of all time: Spartacus, Attila the Hun, Richard the Lionheart, Cortés, Tokugawa Ieyasu and Napoleon. How did these mortal men rise to positions of seemingly invincible power? What were the motives, the personal strengths and often weaknesses that drove them to achieve what no one else dared? In six powerful portraits, McLynn brilliantly evokes the critical moments when each of these warriors proved themselves in battle, changing their own lives, the destiny of their people and, in some cases, the history of the world. We discover what drove Spartacus to take on the might of Rome against seemingly impossible odds, and how the young Napoleon rose to power in dramatic fashion at the Siege of Toulon. 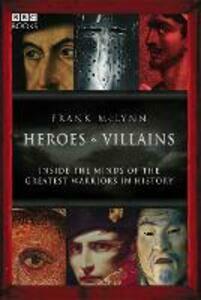 Heroes & Villains is more than a collection of individual biographies. By examining the complex psychologies of these extraordinary men, McLynn builds up a convincing profile of the ultimate warrior. Accompanying a major BBC television series, this brilliant book takes us into the minds of the greatest warriors in history.